Steve Perry - Bio, Married, Wife, Daughter, Net Worth, Where Is He Now? 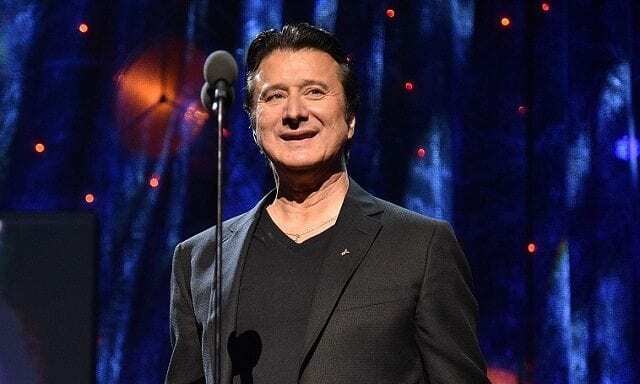 Steve Perry – Bio, Married, Wife, Daughter, Net Worth, Where Is He Now? Steve Perry is an American singer and songwriter popular for being the lead vocalist of “Journey”, a rock band that reigned in the 1970s and ’80s. Perry has such a distinctive voice that scarcely has a match or rival. He has received several monikers such as “The Voice”, “The Golden Voice”, “A Voice in a Million”, among others due to his wide vocal range as well as the uniqueness of his tone embellishment. Perry was born as Stephen Ray Perry on 22nd January 1949, in Hanford California. Though an American citizen, his parents, Mary Quaresma and Raymond Perry were Portuguese and their original last name was Pereira. He is their only child. As for his musical talents, Steve took after his father who was also a vocalist and co-owned radio house KNGS. Unfortunately, Steve Perry’s parents divorced when he was eight. His mum then took him to his grandparent’s place, a farmhouse in rural Northern California. There she raised Steve, encouraging him in his passion for music. They later moved to Lemoore, California where Parry attended high school, drumming in the marching and extracurricular bands. On graduating from high school, Perry proceeded to the College of the Sequoias in Visalia, California. In the early 1970s, he moved to the state capital, Sacramento. Perry had three failed attempts with a music band before finally making it with Journey. The first was the band Ice which he formed with music producer Scott Mathews, progressive rock band, “Pieces” which he formed in Thousand Oaks, California in 1975 with Tim Bogert and “Alien Project” in Banta, California. Perry’s struggles at a music career ended when Walter Herbert, the manager of the San Francisco-based “Journey” gave him a call to help with the band that was struggling at the time. Steve Perry made his debut public appearance with “Journey” in 1977. Following his mother’s death in 1987, Steve took a 7-year hiatus returning in 1994 with a new album titled For The Love of Strange Medicine. In his one decade career (1977-1987) with Journey, Perry provided lead vocals on nine of Journey’s albums namely. He reunited with the band in 1996 but a hip injury made him unfit to play until 1998 when Journey had continued without him, getting several lead vocalists in his place in the subsequent years. Shortly after this, Steven Perry released his third solo project, a compilation album titled Greatest Hits + Five Unreleased. For twenty years (1998-2018), Perry kept a low profile in his music career. He only did a few projects here and there, either in collaboration with a fellow musician or a music band. But at some point, he went completely off anything music. During this period however, Perry’s voice did not completely go into oblivion as Journey’s music having him as the lead singer continued to sell. Their single, “Don’t Stop Believin” from the album Escape particularly continued to gather fame. It became the soundtrack in many popular events and movies including the last lap of hit TV series, The Sopranos. In the last quarter of 2018, Steve Perry came out from the hide. He bounced back to music with a new album, Traces. The album revolved around the loss of a loved one – Kellie Nash, a woman who was instrumental to his return to the studio. Steve Perry used to have a girlfriend, Kellie Nash who was a Doctor of Psychology. Perry saw Nash for the first time in a video clip being put together by a friend, Patty Jenkins, a movie producer, and director of Wonder Woman who was then putting up a project on breast cancer. Kelli Nash happened to be one of the cancer survivors covered in the video. Patty helped Perry to strike contact with Kellie and after a number of meetings, the duo fell deeply in love with each other. That was sometime in 2013. At the time, Kellie Nash was having stage four cancer. Despite knowing fully well that Nash would soon die of the disease, Perry went ahead with the relationship, secretly believing in his heart that their love will cure her cancer. Unfortunately and contrary to his faith, the deadly virus later claimed Kellie’s life in December 2014. Before her death, Perry promised Nash that he would not go back to solitary life after her departure. In fulfillment of this promise, Perry decided to get back to work. Steve Perry has sure had a series of romantic relationships through the years. But as of now, Kellie remains the only woman that he has gone public with. He also had a girlfriend, Sherrie Swafford in the 80’s of whom he sang in his 1984 single “Oh Sherrie“. Meanwhile, Perry has never been married. On Steve Perry’s daughter, the former Journey vocalist has up to date refused to make revealing comments about having any child. Whenever any question relating to the subject pops up, Steve would flatly dismiss it. However, rumors are rife on the web that he’s actually got a daughter named Shamela. The sources say she was a product of Perry’s fleeting romance in his early twenties with a woman whose identity remains a mystery. Shamela has already married and has two sons who are Steve’s grandchildren. Steve Perry has an estimated net worth of $45 million. He primarily made this huge sum during the good old days of Journey. Steve Perry’s band made millions of dollars from record sales and music tours in their soaring years especially between 1981 and 1987. In addition, Steve has made clear that he spends very little. He lives a moderate lifestyle, owning a car per time. So it’s not strange he’s been able to save as much fortune even after his decades-long hiatus from music. Moreover, Journey’s albums continued to sell all through the period he was off, with royalties enough to take care of his basic needs continually rolling in. Steve Perry is back to what he loves doing most – music. However, since after his return, he is determined to continue his career as a solo artist. He has severally made it clear that he has no intention of rejoining Journey. Even as a soloist, he has a lot on his to do list which are worth watching out for. And although his voice has dwindled a bit with age, its most distinguishing qualities still remain – its shade of refinement and deep emotion.